Organic Reactions is a secondary reference which synthesizes the organic chemistry literature around particular chemical transformations. Each chapter of Organic Reactions is devoted to a particular organic chemical reaction, and chapters provide exhaustive coverage of literature work in the form of a tabular survey of known reactions. Mechanistic and experimental details, including the scope and limitations of each transformation, are also included. Organic Reactions is a comprehensive reference work that contains authoritative, critical reviews of many important synthetic reactions. Authors for these chapters are solicited by the board of editors from leading chemists worldwide. The publication process entails a thorough peer-review process, ensuring the high quality and attention to detail for which this series is noted. Organic Reactions chapters focus primarily on the preparative aspects of a given transformation. Particular attention is paid to substrate scope, reaction limitations, stereochemical aspects, effects of chemical structures, and the selection of experimental conditions. Detailed procedures illustrating the significant modifications of the chemical reaction are also included, along with comparisons to other methods to achieve a similar transformation. Every chapter contains a comprehensive compilation all of the published examples of the reaction organized in tables according to the structure of the starting material. Each reaction is presented with information about the reaction conditions, yield, products, and is fully referenced. The aim of Organic Reactions since its initial publication in 1942 has been to assist organic chemists in the design of new experiments by providing "critical discussions of the more important synthetic reactions." Organic Reactions is unique in providing an authoritative discussion of the topic reaction accompanied by tables that organize all published examples of the reaction being reviewed. This combination of critical discussion and thorough coverage is responsible for the leading position this series occupies for scientists interested in the reactions of organic chemistry. An additional distinctive feature of this series is that it is assembled almost entirely through voluntary dedicated efforts of its authors, editors and assistants. The Organic Reactions book series is owned and copyrighted by Organic Reactions, Inc. a not-for-profit, private operating foundation incorporated in the state of Illinois. The books are published by John Wiley and Sons, Inc. who also manage and maintain the Organic Reactions website. The reasons for starting Organic Reactions and the ways in which it was planned to accomplish its goals are well stated in the Introduction to the Series, which is included at the beginning of each volume. 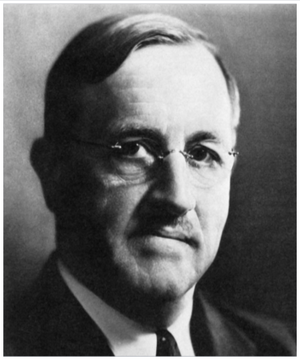 The decision to undertake the preparation and presentation of "critical discussions of the more important (synthetic) reactions" was made at a meeting of the editors of Organic Syntheses and representatives of John Wiley & Sons during the Eighth National Organic Chemistry Symposium at St. Louis in December 1939. At that meeting the organizational setup was agreed upon, the operating procedures were roughed out, and the topics and authors were selected for Volume 1. These actions were formalized by the incorporation of Organic Reactions in Illinois on August 1, 1942, for educational and research purposes, with Roger Adams, Harold R. Snyder, Werner E. Bachmann, John R. Johnson, and Louis F. Fieser as directors, and by the appearance later that year of Volume 1. Roger Adams was elected president and served as President and Editor-in-Chief until he was succeeded in both positions by Arthur C. Cope in 1960 with the publication of Volume 11. He remained an active member of the Editorial Board until his death in 1971. Professor Cope in turn was succeeded in 1966 by Professor William G. Dauben who served from 1966-1984. Subsequent Editors-in-Chief and Presidents of the corporation are: Professor Andrew S. Kende (1984-1988), Professor Leo A. Paquette (1988-2000) Professor Larry E. Overman (2000-2007) and Professor Scott E. Denmark (2008-present). The close relationship of Organic Reactions to Organic Syntheses, Roger Adams, and John Wiley & Sons is obvious; the great value of that relationship is equally obvious to all who have been connected with the series as editors and authors. 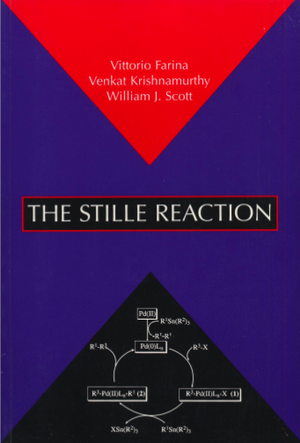 Some Organic Reactions chapters are made into dedicated books, such as this chapter on the Stille reaction by Farina et al. The editors chose the topics to be covered and the authors who would be asked to write the chapters. These decisions, together with discussions of work in progress, were the bases of an annual working dinner for the editors. Invitations to write chapters were extended by the Editor-in-Chief, and those who knew Roger Adams will not be surprised that few invitations were declined. Correspondence with authors and publishers between the annual meetings was handled by one of the editors who also served as secretary. There was no formal rule on an editor's length of service; the informal understanding with the original board of five was that they would serve through the publication of five volumes. Each draft manuscript when received was duplicated and copies were sent to the editors. Every editor read each draft manuscript for accuracy and completeness of the chemistry involved and for clarity and effectiveness of presentation. Comments on these matters were sent in writing by each editor to the Responsible Editor-an editor who had either volunteered or had been "volunteered" (army style) to follow the manuscript, with the aid of the Secretary and the Editor-in-Chief, through to publication or rejection. The Responsible Editor summarized the comments tactfully and sent the summary to the author to enable him to take advantage of the comments in revising the manuscript. The revised manuscript was read by the Responsible Editor and, if it met with his approval and that of the Editor-in-Chief, was copy edited and sent to the publisher. If the revised manuscript was not considered satisfactory it was referred to the Editorial Board, which would recommend rejection, acceptance, additional revision, or assistance by a co-author or an editor. The number of rejections was small but the amount of work done by authors and editors was often considerable. The publisher also copy edited each accepted manuscript and sent it along for composition. Galley proofs were read by all editors and their marked galleys sent to the Secretary who combined the corrections on a set of master galleys that served as the basis for page proofs. All page proofs were read by all editors. Finally, one editor prepared the index and checked the front material, which had been made up by the publisher. The authors, of course, also read galley and page proofs. This page was last modified on 2 September 2016, at 00:56.